1. Preheat the oven to 180°C, gas mark 4. Grease and line the base of two 18cm round sandwich tins with non stick baking parchment. Place the butter in the mixing bowl with the caster sugar, then using an electric whisk or wooden spoon, beat until the mixture is pale and fluffy. 2. Gradually beat the egg into this mixture until it is well mixed. If the mixture looks a little curdled add a spoonful of flour. Using a large metal spoon, fold the flour into the mixture, lightly cutting through the centre and turning it over each time until no traces of flour remain. 3. Spoon the mixture evenly between the prepared tins. Smooth the tops of the cakes with the back of a spoon and bake both on the centre shelf of the oven for 20–25 minutes. When the cakes are cooked, the sides will have shrunk slightly from the tin and the top will be golden and spring back when gently pressed with a finger (a skewer inserted into the centre will come out clean). Allow the cakes to cool for five minutes, then loosen the edge using a round bladed knife and tip onto a folded, clean tea towel. Remove the paper and invert onto the cooling rack (this prevents marks on the top of the cake from the rack). Leave to cool. 4. Select the cake with the best top, then slice the top off the other cake and place it, top downwards, onto a flat serving plate. Spread with the clotted or whipped cream and scatter with the raspberries. Place the second cake on the cream and raspberries, top side up. Spoon a little icing sugar into the sieve and use to dust the top of the cake lightly and evenly. Refrigerate until ready to serve. Eat on the day of making. 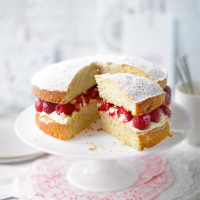 The classic Victoria sponge uses equal quantities of butter, sugar, eggs and flour. Once you have mastered the basic techniques, there are endless flavour variations to try. • For a coffee and walnut flavoured cake: Dissolve 3 tsp coffee granules in 1 tbsp boiling water and cool. Fold into the basic cake mixture with the flour and bake as above. For a coffee-flavoured butter icing, dissolve another 2 tsp coffee granules in 1 tbsp boiling water. Beat 100g softened butter together with 200g sifted icing sugar and the dissolved coffee. Spoon half the filling into a small bowl and stir in 25g chopped walnuts. Sandwich the cakes together with the walnut icing, then spread the remaining icing over the top of the cake. Arrange 8 walnut halves around the top. • For a chocolate flavoured cake: Replace 3 tbsp of the flour with the same quantity of cocoa powder for a delicious chocolate sponge.